After two successful TV series - The Office and Extras - what does Ricky Gervais do for a televised follow-up? Why, the only natural thing: an animated show based on podcasts, of course! The 13 episodes found here started back in 2005, and each one features Gervais, his longtime acting/writing/producing partner Stephen Merchant, and moron-about-town Karl Pilkington. The programs demonstrate a consistent format. Rendered in animated form, we see much of the trio as they chat in a recording studio. In addition, many animated cutaways illustrate the concepts we hear discussed. Despite the series’ title, Pilkington dominates the conversations. Essentially Merchant and Gervais act as inquisitors; they bring up topics and prompt Pilkington to spout his insane notions. Actually, Merchant is closer to the moderator role, as he maintains the calmer/drier personality. While Gervais throws out his own questions, much of the time he does little more than laugh at Pilkington and call him an idiot. Which ironically makes Gervais the weakest link in his own show. Most of the series’ comedy comes from the nutty concepts contributed by Pilkington, so the star doesn’t have a lot to add. Yeah, he provides some witty asides and riffs, but in truth, he really doesn’t do much other than giggle and insult Pilkington, and that gets old – especially because Gervais boasts such a shrill and annoying laugh. This means I suspect the show would work better with just Merchant and Pilkington. 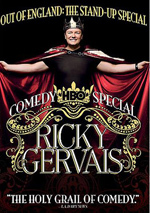 Or maybe not – since Gervais is there and yammers a whole lot, we’ll never know how it would’ve fared without its star. Nonetheless, I can’t say that I think Gervais adds much, and I can’t overstate how much I dislike his laugh; if they blasted his giggle at Osama in his cave, the terrorist would surrender within minutes. I’m not sure how much the animated format adds to the podcasts. On one hand, a good 90 percent of the humor emanates from the dialogue, so there’s only so much the cartoon elements can contribute; at times, the format seems like a gimmick just to allow the producers to put the audio recordings on TV. On the other hand, the animated tidbits do occasionally add to the material. While most of them just illustrate the onscreen action, some add little gags and references that ensure they have value independent of the audio. I still think the animation doesn’t do a ton to embellish the material, but it does help at times. In the end, The Ricky Gervais Show presents general amusement, but fans shouldn’t expect it to live up to the highs of Extras or The Office. It’s a pleasant diversion and that’s about it. 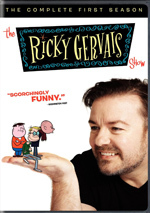 The Ricky Gervais Show appears in an aspect ratio of approximately 1.78:1 on these single-sided, double-layered DVDs; the image has been enhanced for 16X9 televisions. The shows looked okay but that lacked much pizzazz. Jagged edges became the biggest distraction, as virtually all curves showed moderate roughness. Otherwise, sharpness seemed adequate. The programs never appeared especially concise, but they were reasonably accurate, and no shimmering occurred. Source flaws were absent, as the shows looked clean. Colors were also average. While the hues weren’t especially peppy, they seemed reasonably full and rich. Blacks came across as dark and dense, while shadows seemed acceptable and clear. Though this wasn’t a dynamic presentation, the series seemed perfectly watchable. Similar thoughts greeted the ordinary Dolby Digital 5.1 audio of Gervais. Don’t expect much from the soundscape, as it stayed heavily focused on speech. That made sense; the programs emanated from podcasts, so they were originally all about chitchat. The animated shows added other material, though. We got effects to illustrate the stories, and a little music came along for the ride as well. The effects broadened to the sides in a gentle manner but didn’t contribute much. If the surrounds brought out material, I didn’t notice it; this was a decidedly low-key soundfield. Audio quality was perfectly fine. Speech was the most important aspect of the mix, and the lines were consistently concise and natural. Music was a minor element, but the occasional tidbits seemed fairly dynamic. Effects were also more than acceptable. Nothing much impressed, but the sound was satisfactory. Only two extras show up here. Channel 4 Comedy Gala Animation provides a special cartoon clip. The 90-second snippet was created for a March 2010 benefit performance in London; it shows the animated Gervais, Pilkington and Merchant as they discuss the cause at hand. It’s an amusing bonus. We also find an Episode Storyboard for Episode 103, “Charity”. It lasts 23 minutes, 44 seconds as it shows a full storyboard take on that program. It’s vaguely interesting to see a rough version of the show, but it’s not especially enjoyable. After two highly successful TV series, its creator delivers more modest pleasures via The Ricky Gervais Show. Most of the comedy comes from contributor Karl Pilkington; indeed, Gervais himself becomes the show’s weakest link. Still, it’s a reasonably amusing series that keeps us entertained. The DVD provides average picture and audio plus some minor supplements. Fans will likely enjoy this decent collection of comedy.